222 pages | 42 B/W Illus. The application of our Armed Forces within the states and territories of the United States is far from intuitive. The challenges of defending the country against assaults within the homeland are much more complex than engaging our enemies on foreign soil. Likewise, the introduction of the military’s appreciable capabilities in response to disasters, be they natural or manmade, comes with authorities and restrictions reflective of an American ethos that will always hold those forces as the servants of the people, never their overseers. 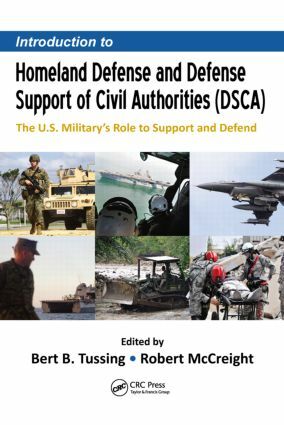 Introduction to Homeland Defense and Defense Support of Civil Authorities (DSCA): The U.S. Military’s Role to Support and Defend examines the requirements and regulations that guide the utilization of our forces in the domestic environment. Professor Bert B. Tussingis Director of Homeland Defense and Security Issues at the U.S. Army War College, where he has served since retiring from the Marine Corps in 2000. He holds master's degrees in Strategic Studies from the Army War College, and National Security and Strategic Studies from the U.S. Naval War College. He has served on special advisory groups for both the Department of Defense and the Department of Homeland Security. In 2014 he was awarded an Honorary Doctorate of Humane Letters by Northwestern State University for his work in homeland security, homeland defense, and defense support of civil authorities. Robert McCreight, PhD,served the United States government at the State Department and in other federal agencies over the span of a 35-year career, before retiring in 2004 and serving as a consultant for major homeland security and national defense contractors. His professional career includes work as an intelligence analyst, treaty negotiator, arms control delegate to the United Nations, counterterrorism advisor, political–military affairs analyst, and Deputy Director of Global Scientific Exchanges at the State Department. He completed his doctoral degree in public administration in 1989 and remains active in graduate education programs in emergency and crisis management as well as in security studies and terrorism analysis.